These are my tiles. I don't have much experience working with tiles, and I'm trying to look at what different people are doing and learning from them, but it's not easy. So I'm just going to post my WIP stuff here, even though I'm still at the stage where I'm experimenting with different approaches. Everything is WIP. All comments are useful. The bush is supposed to be ivy, by the way. It's supposed to cling to the walls, but right now I feel it looks more like a tree than anything. 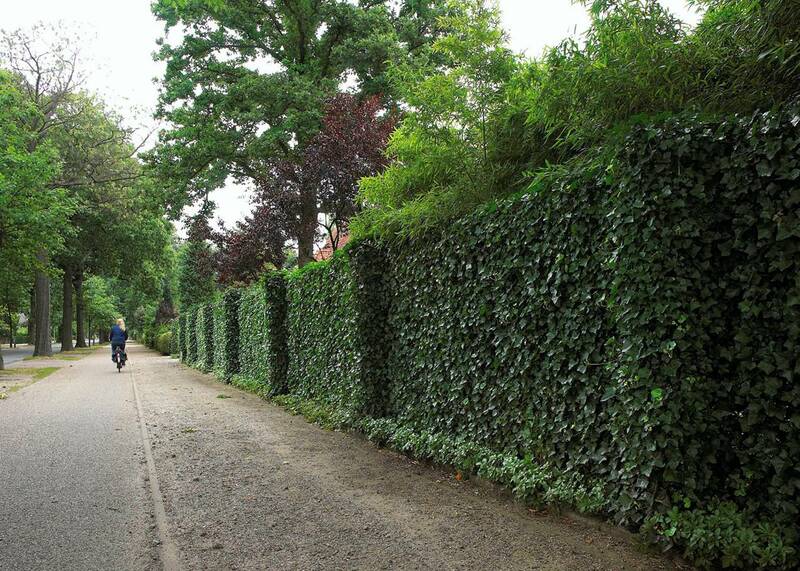 And I don't want it to be just a few scattered ivy leaves on thin branches, I want a massive wall of leaves. The bush offers a beautiful rendition of large, deeply lobed, and solid green leaves: instead of attempting to draw rather different ivy leaves you could give up and adopt some large climber which actually has that sort of leaves, for example Ampelopsis (simple leaf shapes and fancy ones) or other Vitaceae. For the leaves, its weird that they grow out of the trunk at the bottom if you just want them to appear like they are on the wall. That sort of infers that they angle backwards or something to attach to the wall and gives a weird picture. Another thing is that they look like they depress into the wall because of how dark you get in the leaves. It seems like they are really, really thick, when they should be pretty thin. Thanks for your help, guys. 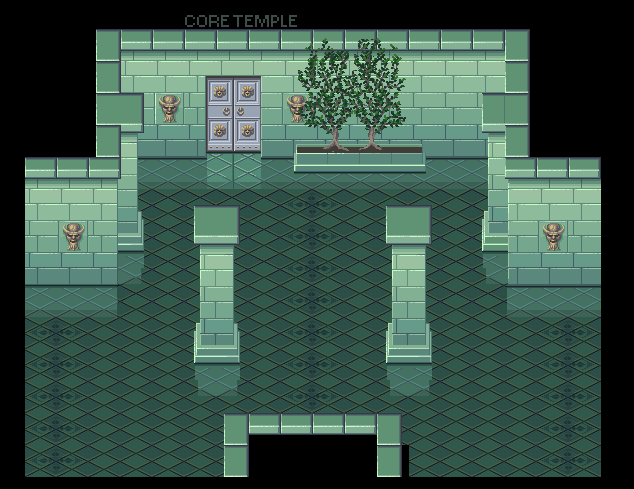 To be honest, the plant was just a minor concern, the major issue is that I have no idea which direction to take with the floor or wall tiles. Shading, texture, reflections, etc, etc. What is good, what is bad? But your feedback in regards to the ivy is much appreciated also. @questseeker: Maybe I'll have to do different plants. I'm not keen on giving up, but if I already nailed the Ampelopsis, I might as well keep it! @Mr. Fahrenheit: I'll get rid of the trunk. I just wanted to make the ivy look really dense, like this, without just making it flat. But I guess I went too far with the contrast and depth, so it now looks way too fluffy. You could probably leave it like it is now that I think of it, if you did like a beveled edge on those tiles so the top and right side were brighter and the bottom and left side were darker showing like an angle towards and away from the light source. That'd probably make it look like it was sticking out then. Wow those are all lovely. I think the problem with the ivy is that it looks like one solid mass. Maybe if you let the wall show through between the leaves in some areas (like around the bottom or close to the outside). Ivy is rarely one thick mass of leaves, there are usually patches and scattered areas of leaves. 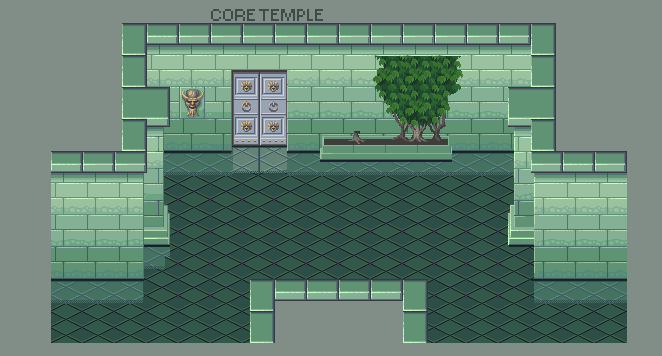 Also, and this might be just me, but one thing that keeps bothering me is the pattern on wall in core picture (right where the stone changes color). It looks like soap suds or bubbles and I'm not sure why it's there. That might just be me though. Thank you. I've tried to amend both issues here. I like where this is going; good readability and volume. Some things don't work so well though. Everything looks hyper-glossy, thanks to edge highlights and floor reflexion. That's also the case in the first post 3 versions. Are you sure this is what you want? The outlines / edge shadows don't make much sense. You have 1px-wide highlights on the left side, which are either bevels (should correspond to a 1px-wide shadow on the right) or just sharp edge speculars (no shadow on the right). Wider shadows than highlights aren't physical. Some parts should cast shadows on others, since light comes from the left: pillars on their bases, left side wall on left side pillar and faraway wall corner. Perspective and proportions: the floor tiles should constrain the proportions of the other tiles, bricks and pillars: right now, each of these seems to play by their own rules. Mostly a problem in the wall tops: the brick lengths can't be the same for facing and side views. 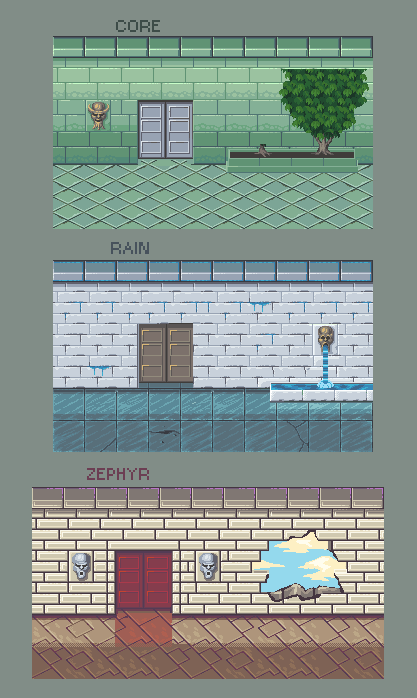 Similarly, in the first post piece, there are 3 different floor tiles perspectives. Nitpicks: the door 'rings' were best centered; the brick staggering hints at widely variable thicknesses in the corners, mostly on pillars. I might prefer the earlier bushes / ivy, provided their colors were closer to the walls so as not too stand out too harshly. Looking at the palette, I find there's many similar looking teals, although I don't really mind that in the piece. Might deserve some tweaking. The doors colors are too different though; a smaller palette might make that less problematic. Thanks, Manupix! Your reply is as helpful as ever! Definitely. I want everything to be so glossy and shiny that it borders on the ridiculous. I've been partially inspired by this wolfenoctis piece, but I want to take the shinyness even further. Thank you, I will take a closer look at the edges and shadows. In regards to the shadows, I hadn't even thought about it untill you brought it up. Hmm, thanks! Probably going to help a lot. Well... at the risk of being a bit obtuse, could you make a suggestion for the wall tops? I'm really not sure how to solve this problem with the 32x32 grid. That's because I was experimenting and didn't really know which way to go. I was just imitating vierbit's tiles and trying to see if I could learn from them. To be honest, I'm still none the wiser. I know his perspective is sometimes inconsistent on purpose, but I don't understand the way the chooses the floor tile perspective and makes it fit to the surroundings. Thanks! The bricks are not actually supposed to be bricks, in the sense of solid slabs of rock, as you'd find in a medieval castle. They're more like stone tiles covering a wall. Like marble walls in a palace. Thanks. I think the first bush looks good, but... it just looks like a bush. Doesn't look like ivy. And I haven't been able to find any good pixel art with this sort of ivy, to learn from. I'll keep experimenting. I'll see if I can get rid of some colours. What do you suggest for the door? I'm rather fond of the white door, because I wanted something to break with the organic theme I've got going everywhere else. In the end, a lot of the walls and pillars are hopefully going to be overgrown with ivy, and it would be nice to have the door(s) clearly visible and separate.